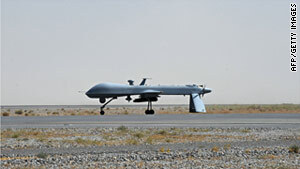 U.S. military drones, like the one above, are often used in Afghanistan by NATO forces. Washington (CNN) -- The deaths of two U.S. service members in southern Afghanistan last week is being investigated as a possible friendly-fire incident, a spokesman for the NATO-led International Security Assistance Force told CNN. The U.S. military has informed relatives it is possible the men were inadvertently killed Wednesday by a missile fired from a U.S. military drone outside Sangin in Afghanistan's Helmand Province, according to spokesman Capt. Ryan Donald. The men were identified as Marine Staff Sgt. Jeremy Smith, assigned to the 4th Marine Division of Houston, and Navy Corpsman Benjamin Rast of the 2nd Marine Division out of San Diego. Donald strongly emphasized Monday the circumstances of the incident remain under investigation and no formal findings have been reached.